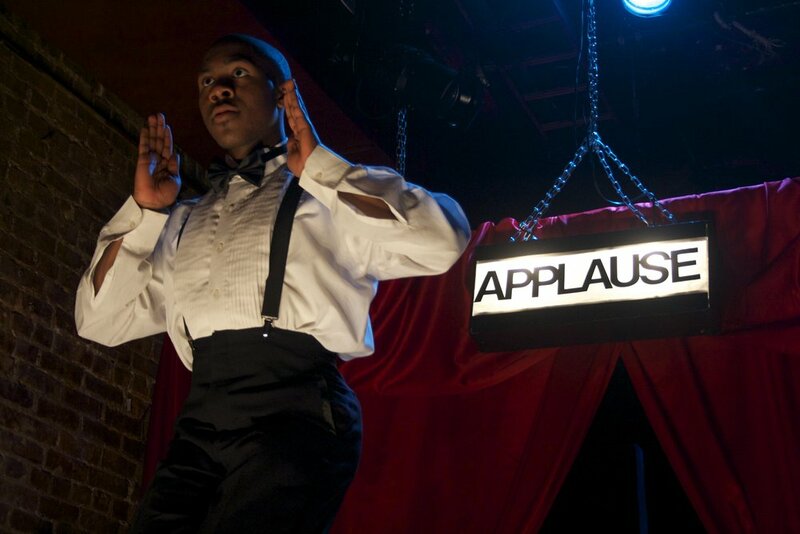 Song and dance man, Noman Whitfield, and slapstick comedian, Lincoln Perry, are black entertainers at the top of their game. 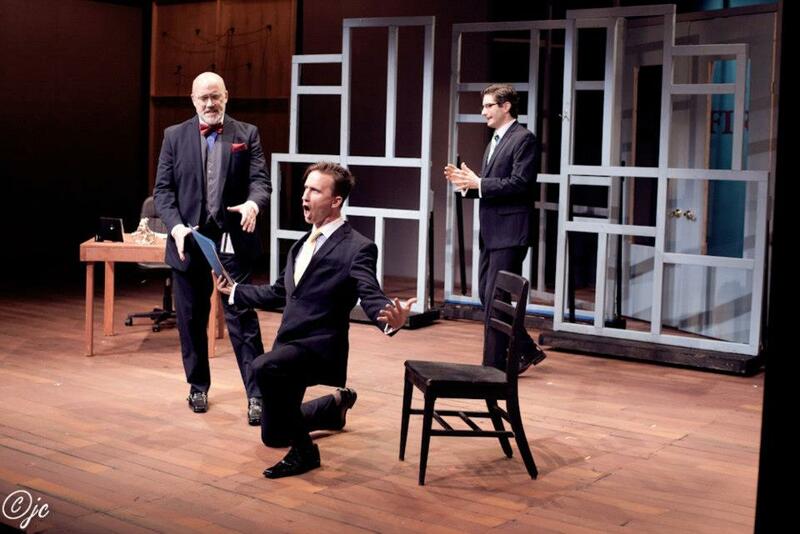 With "make em laugh" as their motto they know just what it takes to keep audiences in their clinches. But big smiles, fancy feet and shuckin' and jivin' may come at a high cost. Last Laugh is a hilarious, at times, shocking character study that exposes the dangerously blurry line between performance and reality. "Think Spike Lee directing The Incredible Afro-Hulk from a screenplay by Charlie Kaufman, and you get a sense of the inner transformations and character mutations that Lockley performs in his 60 minutes on stage," says Daniel Lehman, Backstage, as Eric Lockley reprises his sold-out soloNOVA show exploring if laughter is the best medicine. Blacken the Bubble is an affirmative action comedy set in a "post racial" America. Mega-company Firm Glass is in danger of losing government contracts due to the lack of diversity in their workplace. When they hire Trevor Washington, an African-American, they think their diversity issue is solved. However, when Mr. Washington fails to fill in his race on his paperwork, the office takes desperate measures to convince Trevor to blacken the "correct" bubble. As political correctness flies out the window, everyone—black, white, straight, gay—discovers “inclusion” might be a lot more than they bargained for. Past readings have taken place at The Black Academy of Arts & Letters and was directed by acclaimed Akin Babatunde. The Academy Awards has a race problem. It’s big. But the four black actors in Room 4 aren’t particularly concerned with that, because they have a much bigger problem at hand. They’ve just realized they’re stuck in a time loop, auditioning for the same “Drug Dealer #2” role over and over. What once felt like a messed-up metaphor has become a literal existential nightmare. Get them out of there. 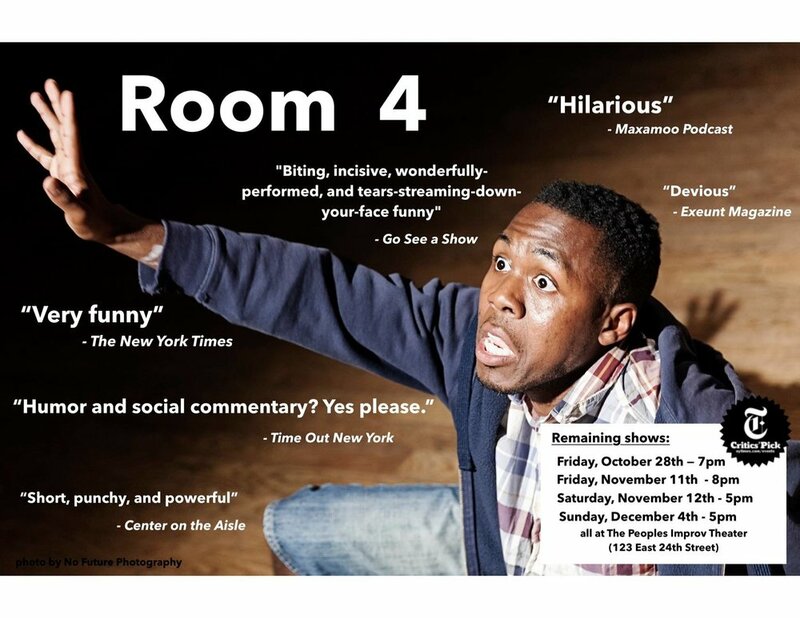 Marina & Nicco’s new play, Room 4, is like “Waiting for Godot” meets “A Chorus Line” meets “Groundhog’s Day” meets “the real-life experience of virtually every black actor in America.” It’s funny, but a little angry, but mostly funny.